I recently made the Vension Medallions in Tangy Sauce from Nourishing Traditions , a cookbook that no kitchen should be without. It was actually very simple: marinate thick slices of venison loin in the juice of two lemons (I got to use my new lemon squeezer ! ), green peppercorns and thyme. Brown the medallions in butter and olive oil. Make a sauce from red wine, beef stock (or vension stock if you have it) and jam (recipe called for blackberry or plum, I happened to have a cabernet sauvignon jam from my CSA so that’s what I used) in the pan you browned the medallions in. It turned out amazing! Test Subject Bill still isn’t crazy about the gamey flavor of venison but I love it. So I ended up eating all the leftovers (more on that later). The sauce is a reduction of the wine, stock and jam. I thought it was going to take forever for the three cups of liquid (2 of stock and 1 of wine) to reduce down and it did take a while but not as long as I thought. I kept the browned medallions in a 200 degree oven to keep them warm while the sauce reduced. My goal was to keep them medium or medium rare and I was mostly successful. I really enjoyed this recipe; easy and delicious. What more do you want? 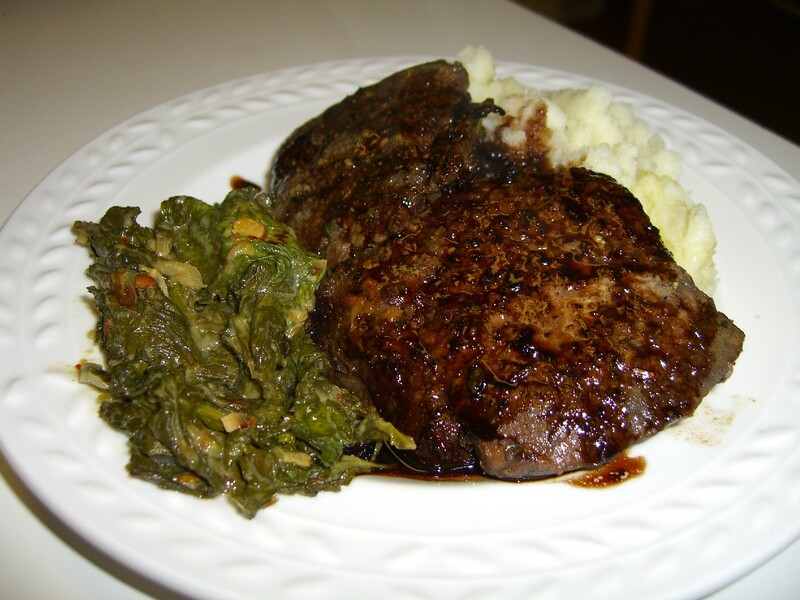 I served the medallions with mashed potatoes and turnip greens following this recipe. I’m not really a fan of the Neely’s per se, but it was worth a try. If I’d actually paid attention to the recipe the greens probably would have turned out better, too. Instead, when I added the dijon mustard I didn’t measure, I just squeezed it in and ended up putting in too much. Those were some TANGY greens, let me tell you. Fortunately, it made them stout enough to stand up to the strong flavor of the vension and they actually ended up going really well together. Serendipity! It was a large loin piece that I used so we ended up with lots of leftover venison medallions. Not to worry – I had ideas. 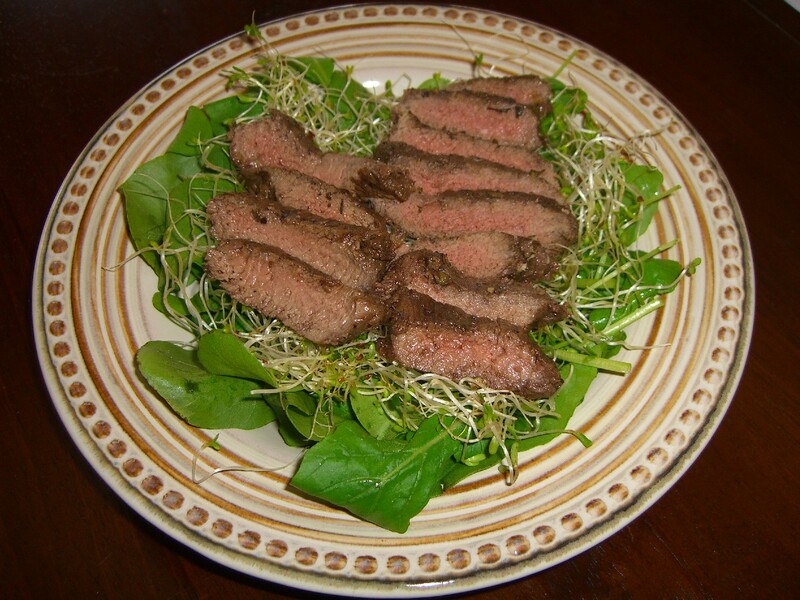 First, for lunch I used some salad greens and alfalfa sprouts from my CSA to make a bed for sliced venison. Drizzled some olive oil over it and called it good. 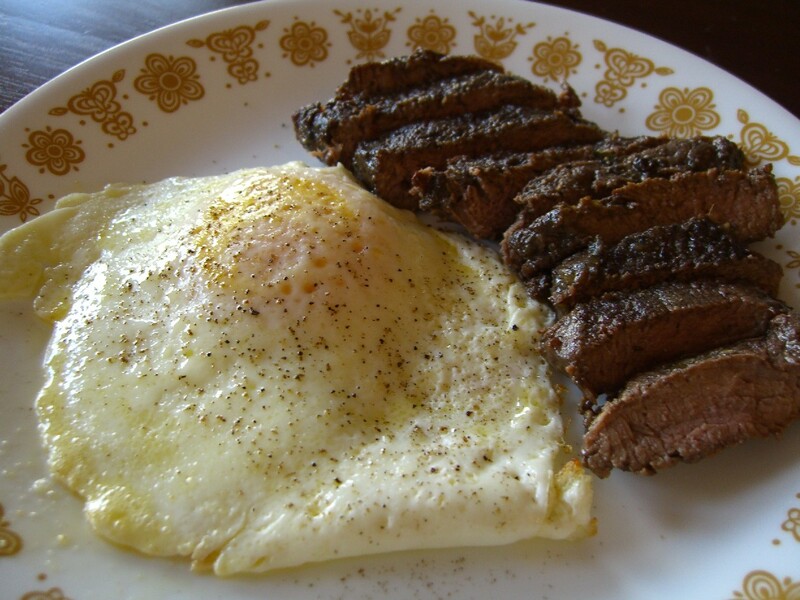 Then for a breakfast, I had “steak” and eggs with more sliced venison medallions. Deer: it’s what’s for every meal!